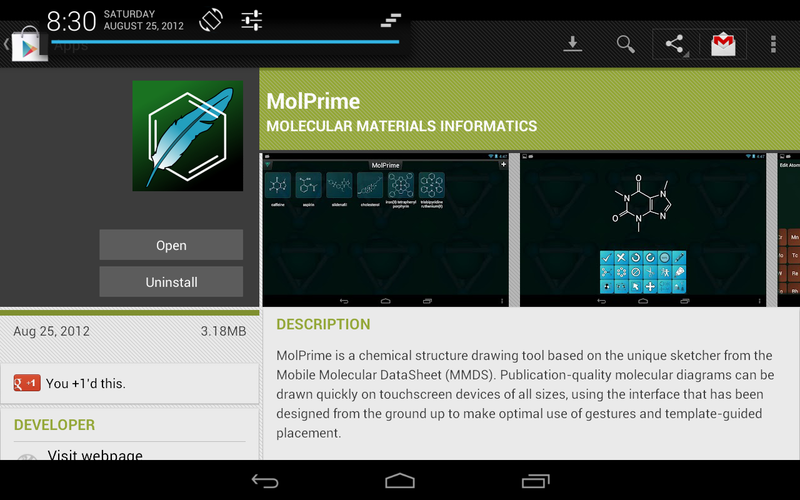 As of now, version 1.0 of MolPrime for Android is available on Google Play. It’s a free app, so if you have an Android device running on operating system 2.3 or later, you can check it out at your leisure. It is a partial port of MolPrime+ for iOS, and is what one might term a “minimum viable product”. It provides a complete implementation of the sketcher, and basic management of a single collection of compounds. The 1.0 version has very little in the way of means for importing/exporting information, and is limited to copying SketchEl/Molfiles onto the clipboard. Putting up a fairly basic product fulfills several goals, the most obvious one being to demonstrate that Molecular Materials Informatics is now a presence on Android, as well as iOS and BlackBerry. Another is to field test the core functionality of MMDSLib, which powers a dozen or so iOS products, and now that it has been ported to Android, has the potential to do likewise for the other wildly successful mobile platform. For anyone who has been feeling left out because they prefer Android, I encourage you to download the app and try it out. Just remember to be nice: it’s an early release, and it’s missing lots of useful secondary features. It should work perfectly on every phone/tablet, but it’s hard to be sure that it will be flawless on yours. So if you have any trouble with it, or want to influence the order in which additional features are ported over, by all means get in touch… preferably by means other than 1-star and a nasty review!